Although the 2015 Jeep Cherokee starts at just over $24,000 with destination in front-drive/4-cylinder form, our loaded all-wheel-drive V6 Trailhawk stickered for $37,415. 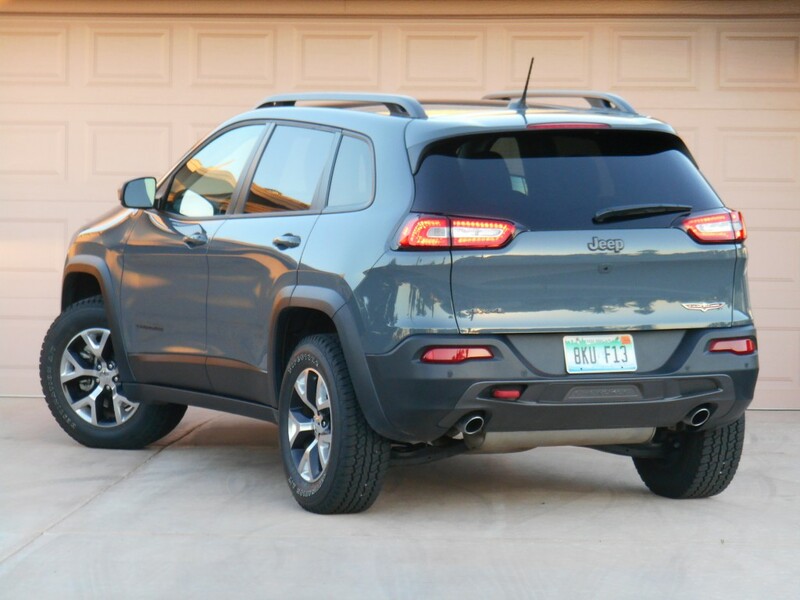 Although the current Jeep Cherokee arrived for 2014 as a “largish” compact SUV, the model name itself is nothing new. It was first used by Jeep in the mid 1970s on a 2-door version of its big 4-door Wagoneer SUV. After that model expired, it was revived for an economy-conscious “downsized” SUV (then considered a compact) in 1984, a popular vehicle that remained in production with few changes through 2001. In the interim, it also graced – in “Grand Cherokee” form – a larger, more luxurious midsizer whose moniker is still in use today. Cherokee casts a larger shadow than most other 5-passenger compact SUVs, yet we found it to be quite maneuverable in tight quarters. 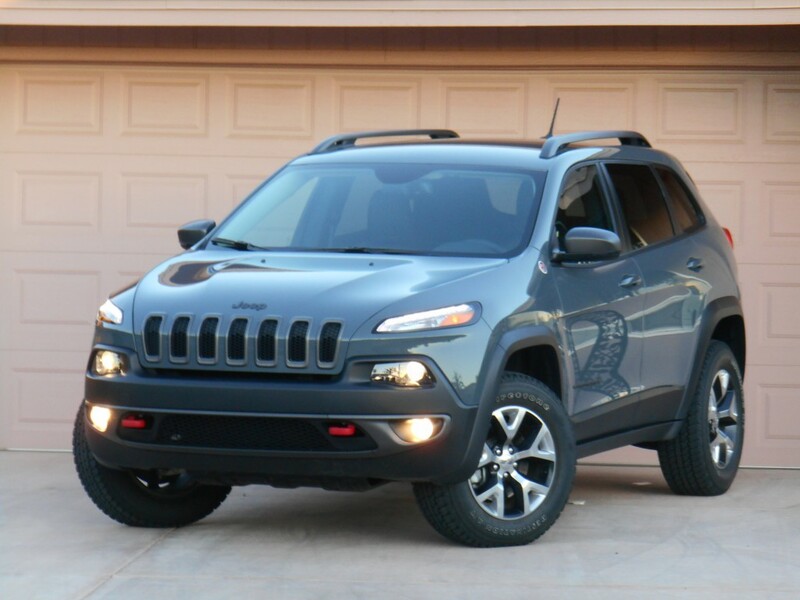 As mentioned, today’s Cherokee – at 182 inches stem-to-stern – is longer than most compact competitors, having two inches on the Toyota RAV4 and 3.5 on the popular Honda CR-V. (It’s also a substantial 14.5-inches longer than the previous-generation Cherokee, which today would be considered a “subcompact.”) Its wheelbase is similarly longer, as is its width. However, cargo capacity trails that of those rivals, though what’s there is nicely useable. Cherokee comes in Sport, Latitude, Altitude, luxury-oriented Limited, and trail-ready Trailhawk trim levels. The standard engine is a 184-horsepower 2.4-liter four, though the tested Trailhawk was fitted with the optional 271-horsepower 3.2-liter V6 – one of the few V6 engines offered in the compact class. Both engines are mated to a 9-speed automatic transmission. Cherokee is offered in front- and all-wheel-drive versions, but the Trailhawk comes with a unique all-wheel-drive system called Active Drive Lock, which not only includes a two-speed transfer case with a Low range gearing for off-road use (rare among compact SUVs), but also a locking rear differential and hill-descent control. Other off-road features unique to the Trailhawk include off-road suspension and tires, raised ride height, underbody skid plates, and tow hooks. “Trailhawk” isn’t a misnomer, as this version of the Cherokee sports special off-road equipment — including low-range gearing — that isn’t available on other Cherokees … or most competitors. The Trailhawk comes standard with a host of features that are optional on lesser models, and our tester was also fitted with optional rear-obstacle detection, blind-spot alert, cross-traffic alert, a power liftgate, remote start, keyless entry and starting, dual-zone climate control, leather upholstery, heated front seats and steering wheel, and a navigation system. That inflated its base price of $29,895 to a rather uncompact-like $37,415 with destination, but that brings a rather loaded SUV with impressive off-road credentials – something few competitors offer. It also brings an SUV that wouldn’t seem to be aimed at everyday commuting. Yet we found the Trailhawk to be quite livable and pleasant in that capacity. 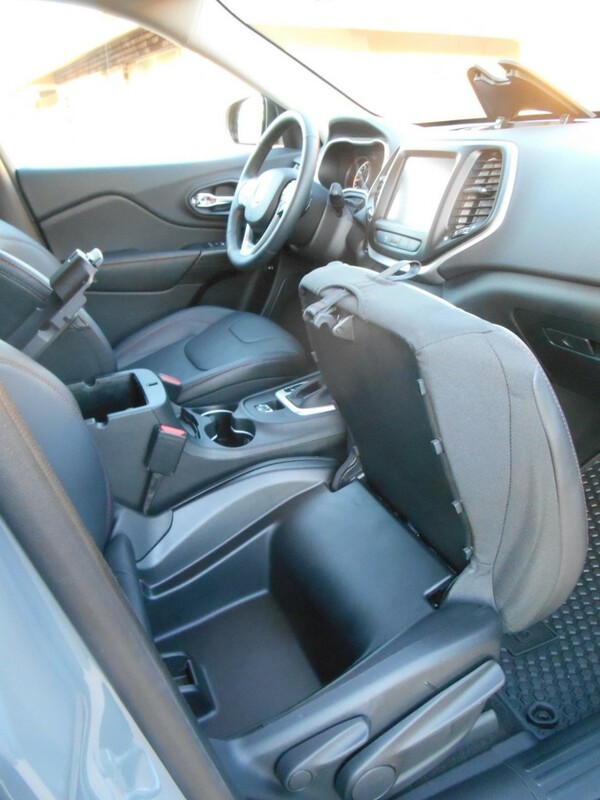 While taller than the compact-SUV norm, step-in height is easily manageable, and the driver’s seat is unusually cushy yet supportive and includes power lumbar adjustment. There’s also plenty of headroom and legroom both front and rear. Interior materials are a cut above the norm with numerous padded surfaces, though only some matte-finished silver trim set off the monotone black color scheme. Visibility is a sore spot, with thick front pillars blocking quite a bit to the front corners, and thick side ones similarly blocking the over-the-shoulder view. It’s better to the rear (and better still if the rear-seat headrests are removed or the seat backs are folded down), aided in part by a rearview camera whose image is displayed on a large 8.4-inch dashboard screen. Although the overall look of our tester’s interior was a bit drab, it boasted easy-to-use controls and plenty of soft-touch surfaces. 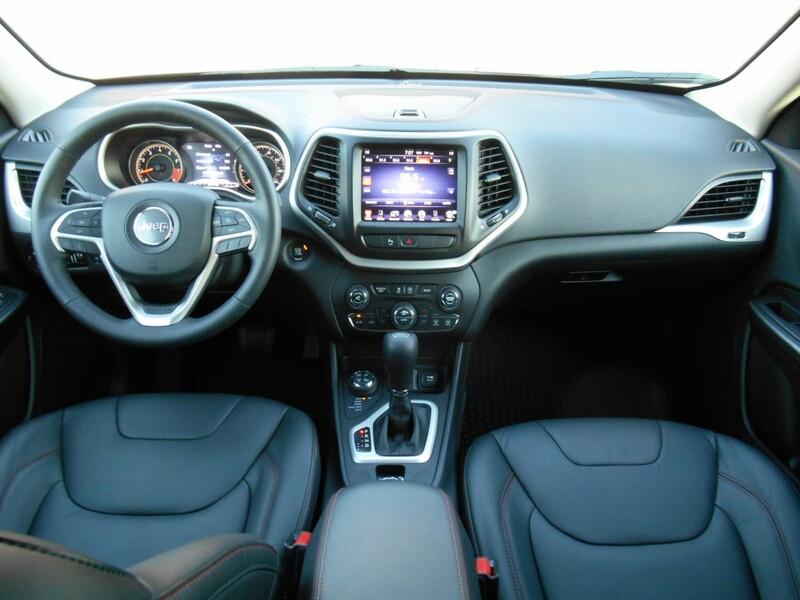 Trailhawk comes standard with Chrysler’s Uconnect infotainment system (which brings the aforementioned large screen), and we find it one of the easier such systems to use. Volume and tuning are adjusted with rotary knobs, while source and station select are done through the touchscreen, which always displays a row of buttons along the bottom to take you right to the phone, navigation, audio, and climate functions. 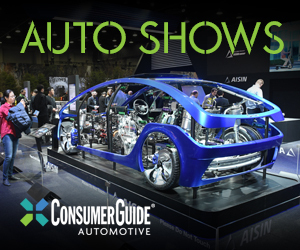 Main climate controls include a rotary fan knob and repetitive-step temperature pushbuttons (not our favorite), with mode adjusted through the screen, along with seat and steering-wheel heat. All controls are easy to reach. Overall cargo capacity isn’t impressive for the Cherokee’s size (being significantly lower in cubic capacity than that of the smaller RAV4 and CR-V), but it’s made up for in cargo cleverness. Rear seat backs fold flat and level with the cargo floor and so does the front passenger seat, allowing the Cherokee to carry long items most rivals can’t. 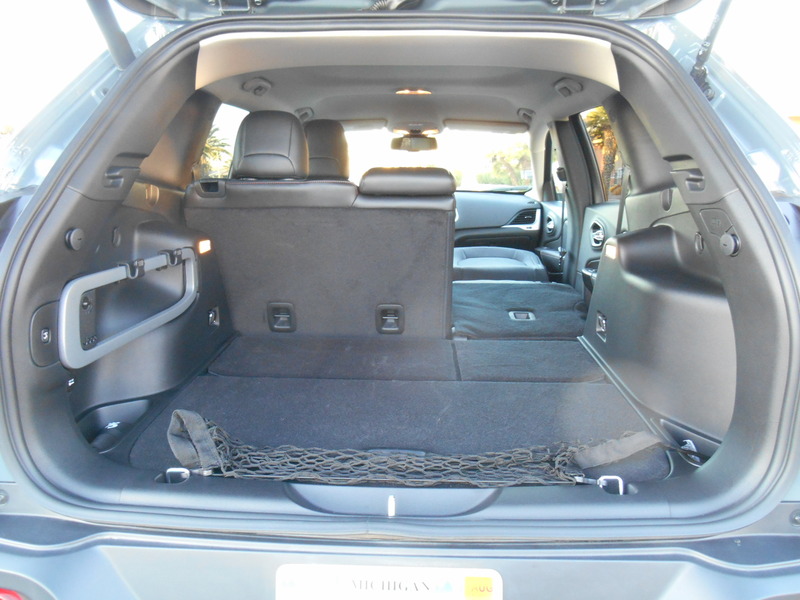 Opening the power liftgate (an unusual convenience in this class) reveals a wide cargo area with side bins (though no underfloor storage save for some “unofficial” space within the spare tire’s wheel), and the rear seat backs fold level and flat with the cargo floor. The front-passenger seat back also folds flat and level with the floor, making for a usefully long channel. There’s a large “secret” bin under the front-passenger seat cushion, along with a deep glovebox, good-sized 2-tiered console box with 12-volt and USB plugs, a forward console tray under Aux/USB/SD card/12-volt plugs, two console cupholders, a small console tray, a covered dashtop bin, a left-side dash bin, and small map pockets in the doors; overall, an unusually versatile cargo area and a nearly unbeatable amount of driver-accessible storage. Although the Phoenix area where this test was conducted isn’t known for its potholes, the Trailhawk seemed to take bumps in stride with well-controlled compliance and little undue thumping. Steering and handling were similarly likeable, and it seemed surprisingly maneuverable in tight quarters. A dashtop bin and a hidden compartment under the passenger-seat cushion join a left-side dash tray as being unusual and handy storage spaces. As expected, the V6 provides plenty of power, at least around town; highway passing power isn’t quite as impressive. Neither are the transmission’s downshifts, which always seem to take far longer than they should to execute – something we’ve found to be a general characteristic of Chrysler’s new 9-speed automatic. The V6 comes with a start-stop system that shuts it off at stoplights. We found it smooth enough in operation, but like most such systems, it could be caught flat-footed if you move quickly from the brake pedal to the gas. (It can be manually deactivated if desired, though you have to do it each time you start the vehicle.) In an even mix of city/highway driving, we averaged 21.8 mpg, almost exactly matching the EPA’s 22-mpg combined figure. The engine makes a rich note under throttle, and the highway ride is surprisingly serene given the tires’ aggressive tread pattern. Cherokee has been a big seller for Jeep, and it’s not difficult to understand why. While not without its flaws, it counters them with unusually impressive cargo solutions, and in the case of the Trailhawk, equally impressive off-road capability along with a brawny look that sets it apart from the “cute ute” crowd. 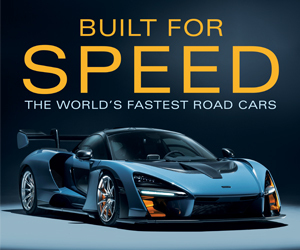 Written by: The Daily Drive staff on May 11, 2015.on March 22, 2019.